Dual-mode delay: "modern" and "vintage." 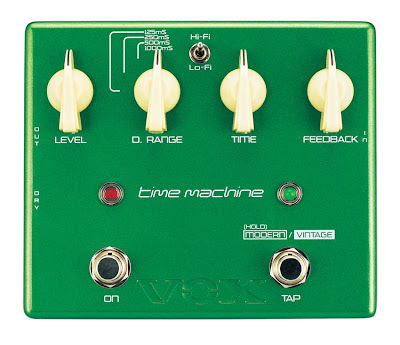 The time machine provides both "modern" and "vintage" delay modes. The modern mode mirrors your original sound with full clarity and fidelity, and will fit any style of music. 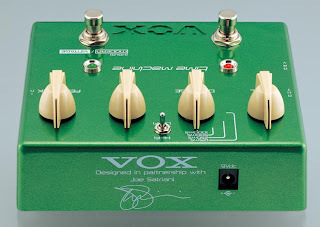 As its name suggests, the vintage mode delivers the sound of a classic tape delay unit. A proprietary saturation circuit creates a warm, analog sound with a nice sense of distortion. 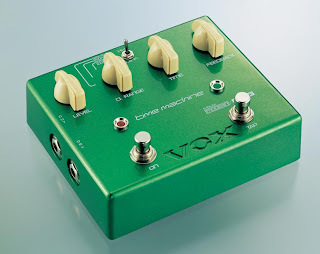 Gentle modulation is also applied in the vintage mode, reproducing the slight warbling produced by a tape-based delay. The amazing effectiveness is the result of an uncompromising process of testing and refining carried out by Joe and VOX. Joe wanted to get a sound that blends nicely with the other performers – whether you're on stage or in the studio – and yet also has some thickness to the tone. The solution was to add a Hi-Fi/Lo-Fi switch to the time machine. The Hi-Fi mode delivers a transparent, uncolored sound. The Lo-Fi mode, on the other hand, provides a distinctive EQ, combining both high-pass and low-pass filters. This EQ uses filters that have been precisely adjusted to Joe's taste, so that your guitar sound will blend naturally in the mix – without obscuring or interfering with the other players. 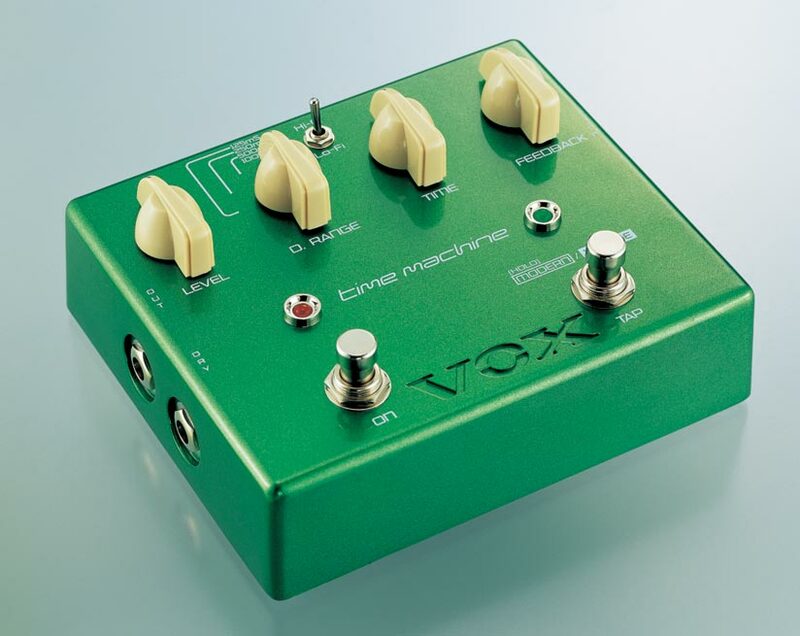 The time machine is a pedal like no other, one that expands your sound-creating potential through a variety practical functions. The delay time is adjustable over a broad range – from 30ms slapback to nearly six full seconds of delay*. You can also use the tap tempo switch to set the delay as triplets, eighth notes, dotted eighth notes, or quarter notes depending on the delay range position setting. The chicken-head knobs that are a VOX tradition (and also favored by Joe) allow you to make fine adjustments – even while holding a pick – so it's easy to make quick yet precise changes. There are also two OUTPUT jacks, so the unprocessed "dry" sound and the processed "wet" sound can be output separately. By connecting these two jacks to different amps, you can obtain spacious delay sounds that are highly effective in any playing environment. (*) Maximum delay is 5800 milliseconds when using the tap temp switch and 1000 milliseconds when using the delay control.